The smoking wreckage of the Alfred P. Murrah Federal Building in downtown Oklahoma City on April 19,1995. The truck bomb that destroyed it killed 168 men, women and children and wounded hundreds. Photo by Jim Argo, courtesy of The Oklahoman. 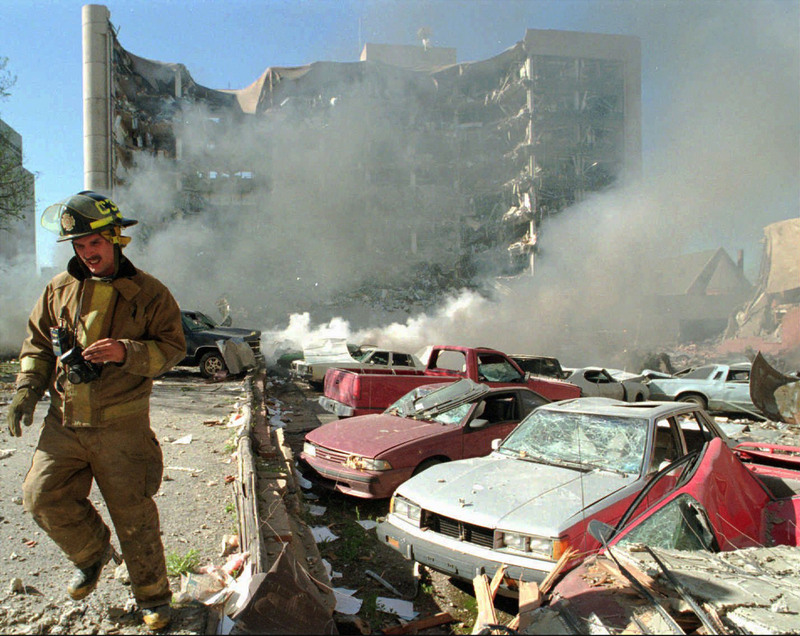 What does the Oklahoma City bombing mean now, two decades later? Will the memory and meaning of April 19, 1995, gradually recede into a distant echo? That’s hard to believe as one considers the extensive observances and media coverage this month. The grief and shock of what happened are as palpable as ever: On a sunny Wednesday morning, a terrorist bomb ripped apart the Alfred P. Murrah Federal Building, killing 168 men, women and children. Those who saw it will never forget the black smoke rising in the sky, the bloody images of the injured, and the wreckage of the building marring the downtown skyline. This multimedia story, including a video and a podcast, revolves around a question: What has changed because of the bombing? Oklahoma Watch spoke with several experts or leaders about their views on the impact of the worst act of domestic terrorism in U.S. history. Bronze chairs stand in the footprint of the Alfred. P. Murrah Federal Building. Each one sits on a glass base with the name of one victim. The street that once ran in front of the destroyed building is now a reflecting pool, running the length of where the Alfred P. Murrah Federal Building once stood. Two bronze gates stand at each end of the reflecting pool, inscribed with the time one minute before, and one minute after, a terrorist bomb destroyed the Alfred P. Murrah Federal Building in Oklahoma City. A tree that survived the bombing is incorporated into the memorial, to honor the survivors. The limbs of the Survivor Tree embrace the 9:03 Gate at the Oklahoma City National Memorial. Chairs of the fallen are aligned in the footprint of the destroyed Alfred P. Murrah Federal Building. On that terrible morning, Oklahoma City Assistant Fire Chief Jon Hansen, the Oklahoma City Fire Department’s public information officer among other duties, was thrust into the forefront of the act of terror. Through the search and rescue operations, daily body counts and more, Hansen’s daily briefings from the epicenter of rescue and recovery gave him unique insights. What changes have you seen, from your perspective, that came following the bombing of the Murrah Federal Building and from Oklahoma’s response? I think we learned, as different disciplines, how much we need the other disciplines. Fire service needs law enforcement. Law enforcement needs emergency management. Emergency management needs total cooperation, and so on. I think (the bombing) taught us a valuable lesson — one we knew in the backs of our heads, but sometimes we were scared to admit. The public safety community, when you have the larger events, such as the Murrah Building, wildfire, tornado, flood—we learn how much we rely on our friends in law enforcement, our emergency management system, and how much we rely on volunteer groups. How did that response operate? We used ICS (incident command system). The fire service, we use it on just about every event we have — motor vehicle accident, structure fire — and always have. We formed something called “unified command.” There was a fire command officer and a police command officer. We were operating shoulder-to-shoulder, together, taking care of individual needs but also complementing each other, and I think that’s what folks really saw, a multi-disciplined command system. We really hadn’t done that part as well as we should have before. Now, that’s happening all over the country. When you look at the hurricanes, floods and wildfires, they form a unified command, often. Was that part of the “Oklahoma Standard” that everyone talks about, or is that something different? The Oklahoma standard that we saw wasn’t necessarily set by the public safety agencies. We feel like we did our job. We did what the public expected us to do … something that we were trained to do and should have done for our citizens. What brought the Oklahoma Standard to the forefront was the community response. It was the citizens of the great state of Oklahoma who stepped up and provided, a lot of times without even asking, help, support, volunteers and different non-emergency functions … The volunteerism that they provided was the Oklahoma Standard. That’s what made the core of the Oklahoma Standard in my opinion. 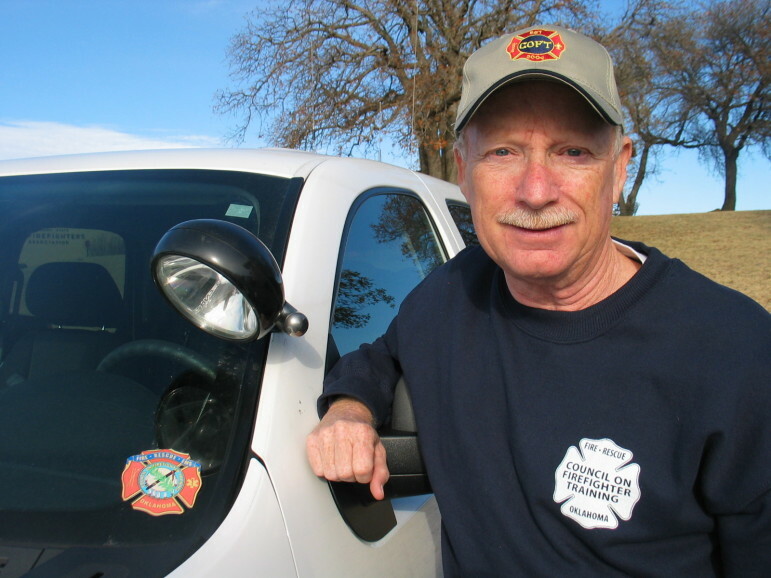 Jon Hansen is the executive director for the Oklahoma Council on Firefighter Training, training volunteer and professional firefighters, emergency response personnel and those in related occupations across the state. 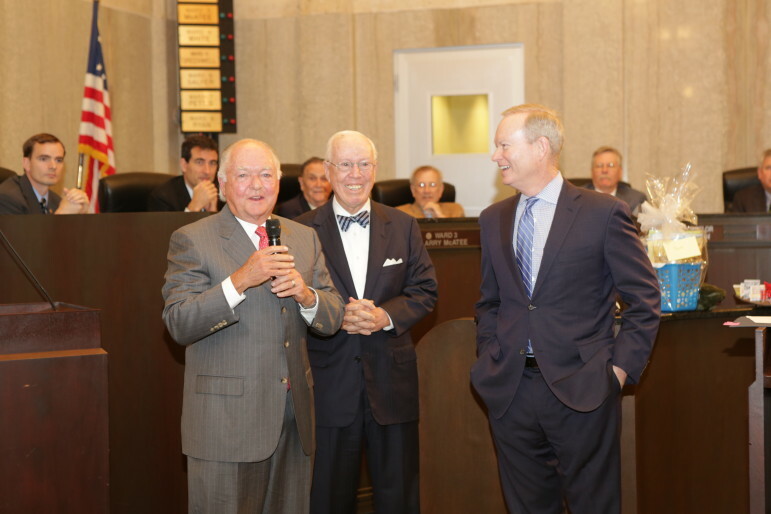 Former Mayor Ron Norick, left, makes a presentation with former mayor Andrew Coats and current Mayor Mick Cornett. On the morning of the bombing, Oklahoma City Mayor Ron Norick was speaking to a former mayor, his father James Norick, when a blast shook his business office on North Grand Boulevard. Looking out the window, he saw a black plume of smoke rising over downtown. About an hour later, two police detectives escorted Norick to the site, where he met with then-police chief Sam Gonzalez and Fire Chief Gary Marrs. Norick said his job was to coordinate support efforts, such as having fencing put around the site and maintaining contact with the governor’s office, as well as making media appearances to update the public on the situation. The scale of the disaster – 300 buildings sustaining damage and several businesses being displaced – meant that most other projects, including a massive citywide project, would be temporarily put on hold. That project, the Metropolitan Area Projects Plan, known as MAPS, was a 1 percent sales tax dedicated to funding capital improvement projects now widely credited with revitalizing downtown Oklahoma City. MAPS, passed by voters in December 1993, had been championed by Norick as a way to invest in downtown to attract businesses to the city after the oil bust of the 1980s and failed attempts to bring employers to the area. Norick said the bombing pulled together people from all over the city, regardless of class or race, who tried to help the survivors, the victims’ families and the emergency workers searching the rubble. The bombing, Norick said, taught him a lot about the depths of human cruelty, as well as the depths of human compassion and resilience. Eventually, the city turned its attention to MAPS again and moved forward.